ECLA’s musical activities include individual voice lessons, choir, dance project and also learning to play instruments. This new student project invites all those interested in learning to play an instrument to meet every week in ECLA’s Music Room for lessons with a few students skilled in guitar and piano. Who hasn’t dreamt of being a rock star at least once when singing in the shower? Well, the next step is to combine ambitions with your personal taste in music and begin to rehearse favourite songs, which is – as our tutors say – the best way to start off when dealing with a new instrument. Daria Coscodan (Academy Year, 2007) offers piano lessons in individual sessions. The main goal one should set for such lessons, she says, is to “avoid having great expectations and just play music for the sake of music”. As there is not nearly enough time left for us to become virtuosos by the end of the academic year, progress depends on personal dedication and willingness to practice individually. Understanding this, student-tutors also offer one-to-one sessions, while the regular meetings take place on Monday evenings. Moreover, once every two weeks music lovers come together to share their experience and work on playing together. As Timur Abenov (Academy Year, 2007) explains, “we have some really dedicated and enthusiastic students – students are as important to the project as tutors”. 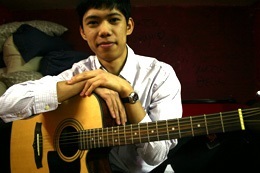 Tim is glad to be teaching guitar, because “it’s a good exercise for the teacher as well as the student. Plus, it is a valuable activity for strengthening our community relations, outside of academics”. Daria, who studied music for nine years, is enthusiastic about her first time teaching music and hopes to bring together an ECLA band, which would include vocals as well. “I’ve experimented a bit with my friends, but never gave official lessons. I enjoy doing this because I feel music balances our studies” said Daria. Tim has always wanted to teach guitar, because his own skills were acquired with the help of friends who taught him as a teenager. Now Tim and Daria have the opportunity to pass on their skills and offer lessons in classical guitar and piano, chord- based guitar, jazz piano and music theory (the latter with Professor Geoff Lehman). Although sometimes it feels like our schedule is loaded enough as it is, having the chance to improve or start anew in playing music is certainly worth the effort.